You can generate leads with your blog. Lots of them. When I started AutoGrow, I was broke as hell. I had less than $200 in the bank and I was sleeping at my parents’ house. Over the next few years, I went on to create three separate 6-figure sales funnels for my business’s service. Each one grew to 6-figures a bit faster: 10 months, 6 months, and then 1 month, respectively. Now we’re at a point where we are generating around 1,301 leads per month (and growing) just from our blog. With a few easy tweaks to your marketing system, you can go from generating 1–2 leads per month, to literally generating 100-200 leads. And if you sell B2B services or other high-ticket items, the math (Average Client Value X Close Rate) says that the value of just ONE lead to your business is worth hundreds or even thousands of dollars. By following the tips in this guide, I’m confident that you can do even better and in less time. Below I’m going to give you 5 practical, easy to implement tips (along with a couple of bonuses!) to help you get results from your content marketing activities faster so you’re less likely to become discouraged or give up. When it comes to blogging, consistency is key. One of the biggest factors in blogging success is forming a habit and publishing content regularly. And it doesn’t matter how often you publish. It can be weekly or monthly, as long as you always stick to that schedule. But writing can be tough. It takes up a lot of time. Other things pop up. You get sick. The kids have soccer practice. Dinners need to be made. … and then you’ve gone two months without publishing anything and your audience has totally forgotten you. When you do finally write something new, you feel that they don’t care anymore. They’ve moved on to the next guy. How do you stop that from happening? Create a daily writing habit. Just being “smart” doesn’t make you great at anything. In business and in blogging, dedication is the key to results. Writing is never easy. It’s work. But, that’s not the answer you want, and actually, there’s a better way to frame it. As Scott Adams, the cartoonist behind Dilbert puts it, we’re like “fleshy robots” ready to be programmed. And the more we practice something, the faster and easier it becomes, almost to the point of you being on autopilot. On average, it takes more than 2 months for anything to become a habit (66 days in fact). Those 2 months might be grueling. You might hate your life. But eventually you’ll go on autopilot. Once something is a habit, it’s simple. You’ll do it without even thinking about it. One of the worst things as a writer is to sit down in front of a blank screen and …. well, go blank. One way to avoid that? Take the time to brainstorm a list of topics in advance. Think about what your audience might be interested in. Depending on your niche, there may be several themes you can write about, so mix it up. Anytime you think of something new, add it to the list. Anytime someone asks you a question about something, add it to the list. Anytime you see a competitor write about something cool, add it to the list. Different bloggers have different schedules—there is no one-size-fits-all solution. Pick a schedule that works for you, whether it’s twice a week or twice a month, and stick to it. But be realistic. The worst thing you can do is to start out publishing on a regular schedule and then fall off the wagon. It’s demoralizing for you and it’s troublesome for your audience. They’ll wonder what happened to you for a couple of days … and then they’ll move on. Once you have some topics in mind and you know how often you’re going to post, plan out a calendar. A content calendar helps you keep track of projects from inception to publication. More importantly, it keeps you on track with what and when to publish, so you’re not struck by indecisiveness when the time comes. Before writing becomes a daily habit for you, you’ll need something to remind you of the task at hand. A “trigger” is something that reminds you of something else. Think of Pavlov’s dog, for example. When he heard the bell, he knew it was time to eat. When it comes to writing, you’re not going to remember to do it all the time (at least not in the beginning). One of the easiest things to do is to set a reminder alarm on your phone. If that doesn’t work, you can add it to your task manager (like Trello) or even write it down in your planner if you’re old-fashioned like that. The whole point of a writing habit is to do something daily. 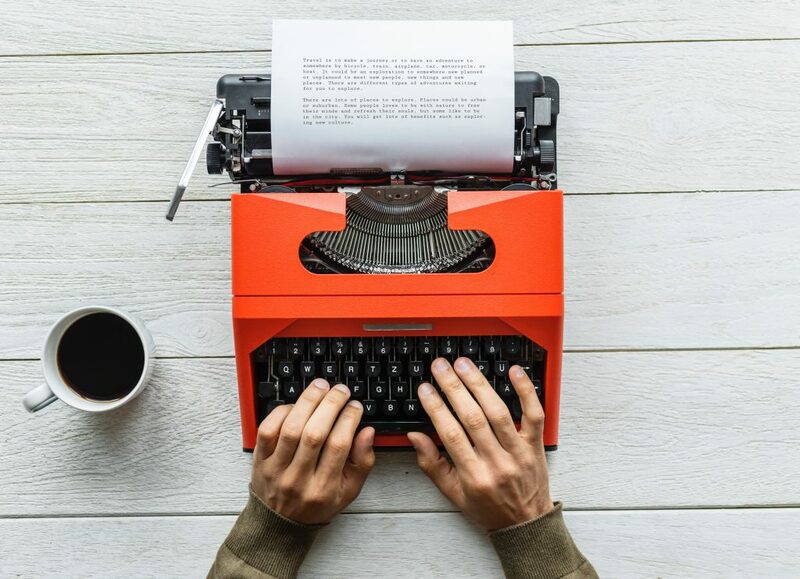 Even if you’re only publishing once a month, it’s important to flex your writing muscles regularly. It not only creates better habits, but it makes you a stronger writer. 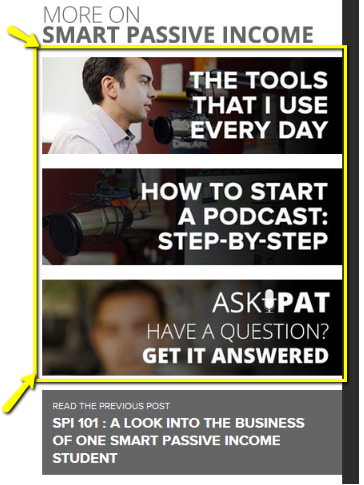 I’m going to close this section with a case study from ProBlogger. Published 51 blog posts, which is almost one a week. Updated and improved countless prior posts. Improved the quality of her blog posts due to the increased practice. Completed a 23,000-word travel guide. Increased her blog traffic by 24% (comparing October 2016 to October 2017). While 30 minutes a day might not sound like very much, it made a huge difference for her. And it will for you, too. Want another case study example? Back in January of 2014, I started writing and publishing on AutoGrow just ONE time per week, writing for about 60 minutes per day in the morning, every morning. But consistency over the course of weeks we were hitting 5,000 visits per month easily pretty soon. Fast-forward to today where we still publish 1 in-depth article every Tuesday (and sometimes more) and we saw 36,000 visits to our site last month and growing. That’s the power habit, or, if you prefer, a blogging system. One surefire way to improve your own content? Check out your competition. This is especially true if you’re new to blogging and you’re not really sure what “works” yet. Watching what other people do, and seeing what resonates with their audience, can help you find your own groove. Moz offers a ton of free SEO tools, but one of our favorites is the MozBar (a free Chrome extension). The MozBar allows you to view any website’s Domain Authority—a search engine ranking score developed by Moz that predicts how well a page will display in search engine results. Scores range from 1–100, and the higher the score, the higher that page’s ability to rank. Likewise, you can use the same tool to view Page Authority. Same idea, only it ranks individual pages rather than entire websites. Why is this important? Because the higher a blog ranks in search results, the more likely they are to be read. Check out your competitors and see what they score. If they rank well, find out what they’re doing. Do you know why people share content? They find it interesting. They find it informative. It makes them feel something. There are lots of reasons, but one thing holds true: they think it’s something other people would like to see, and so they share it. And guess what? When people share your content, it affects your overall SEO. 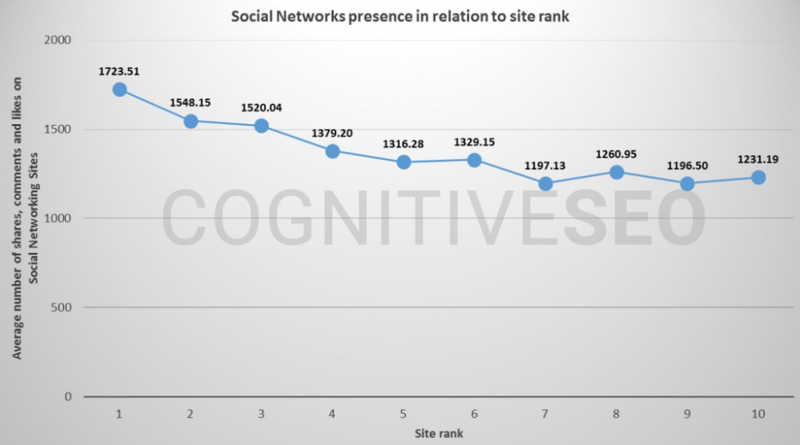 According to a 2016 white paper from Searchmetrics, there is a very high correlation between social signals and ranking factor. People want to do what they see their friends doing. Social proof is real and it’s powerful. So, what does this have to do with your competitors? Well, if people are sharing content from their sites, they’ll probably share similar content from your site as well. If you find out what works for them, you can make it work for you. We like using BuzzSumo for this. It’s sort of like Google Analytics—only you can view other people’s info. Using BuzzSumo, you can enter any domain name and the tool instantly analyzes that site. You then get a table containing the number of social shares for each of that website’s posts and the posts with the highest number of shares are at the top of the list. From there, you can see how many shares each post got on each network, its evergreen score, and you can even view backlinks. 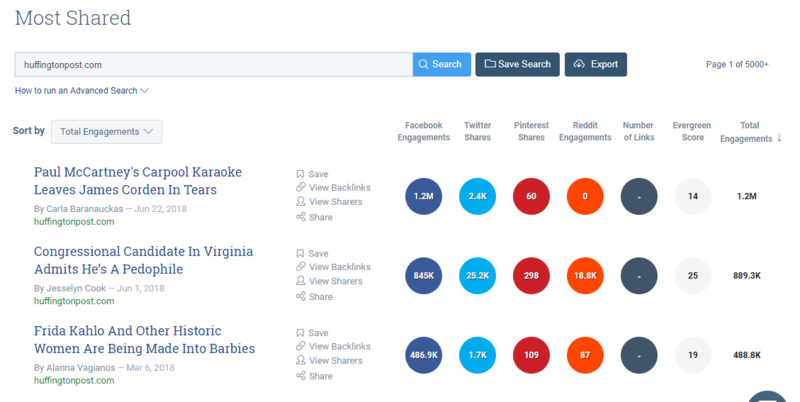 By searching for your closest competitors, you can see what topics are most popular for them and which social networks yield the greatest results. If you want to dig a little deeper, you can click on the link and see what kind of media they use. Do the more popular articles include a lot of images? Are people sharing content that includes more infographics and charts? Now go do what they’re doing. There’s no shame in that game! Today’s audience wants to feel a connection and they want to feel understood. They want to feel like you “get” them. They don’t want the hard sell. Instead, you must nurture them and create a genuine relationship. Obviously, one way to do that is through providing quality content. Give your audience informative, useful information that they actually need. The question is: how do you know what your audience needs? One of the best ways to discover your audience’s pain points is through monitoring online conversations. You can do it the old-fashioned way—hang out in Facebook groups, follow hashtags, read blog comments, etc.—or you can invest in a tool that’ll do all that for you. Brandwatch is a great example and one I personally like to use. With Brandwatch, you can search the internet for reviews, articles, comments, and conversations on any topic. From there, you can create rules to segment the data into categories that are relevant for your business, break down and analyze the data, and receive real-time email alerts with any updates. The best part? You can use this same tool to monitor competitors. Two birds, one stone, ya know? When doing your research, it’s also important to be aware of what people are saying about the competition. For instance, if you see that your main competition has several complaints about customer service, you can use that information to your advantage. Start advertising your exceptional service. Talk about your fast response rate. Give people what they need! Running analytics and monitoring conversations takes some time, but it’s so worth the effort. You’ve come this far. Why not just keep going, right? Dive in a little deeper. 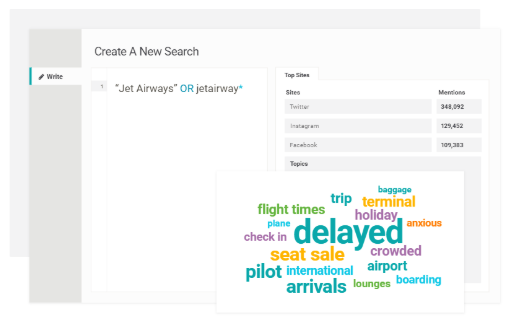 Find what people are searching for and what keywords are trending. 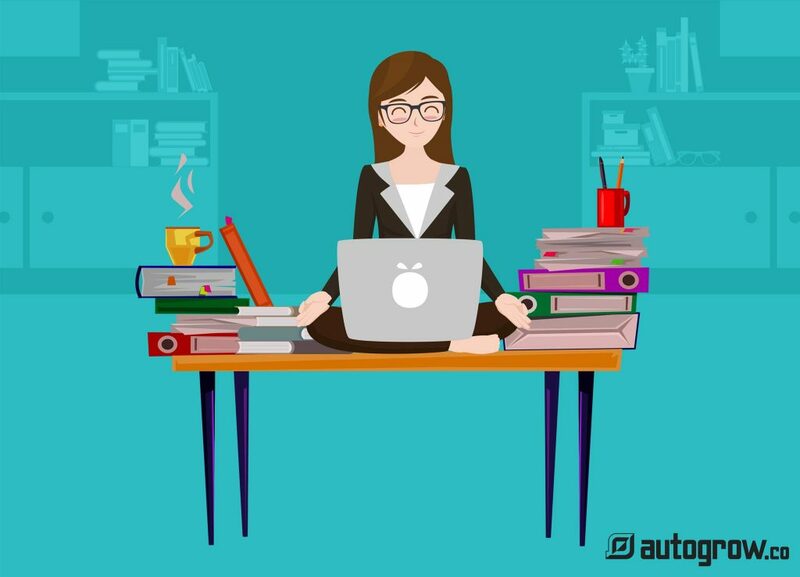 Most entrepreneurs create a blog post, hit publish, do some light promotion on social media, and they see a little spike in traffic. They put in the minimal amount of effort required to get something out there, and they get a minimal result. Ideally, you want to publish content that gets you lots of relevant, residual traffic over time. You can’t do that if you if you’re not willing to put the work in. The way to maximize the productivity of each piece of blog content is to do your research up front. Find out the actual words people are searching for to find articles similar to the one you’re about to write. This tool allows you to see what keywords are related to any given topic. It also shows you the approximate monthly search volume for each keyword as well as the level of competition among advertisers for those keywords (classified as either Low, Medium, or High competition). You can use this data to make an educated guess as to which keywords are most valuable and worth targeting, relative to other keywords you’re considering. If competition is high, then it’s possible that keyword is a lead generating or revenue source for other companies and therefore worth your time to target. Trends let’s you check the relative popularity of different keywords and visually compare their search volume at an international as well as a local level. It’s not so useful for longer tail keyword phrases, but I recommend using it to see which keywords are rising and which ones are falling. Performing a general Google search for related keywords is also useful. This allows you to see how close the title tags (HTML tags) match the keywords you’ll be targeting as well as how relevant their content is to the search terms. 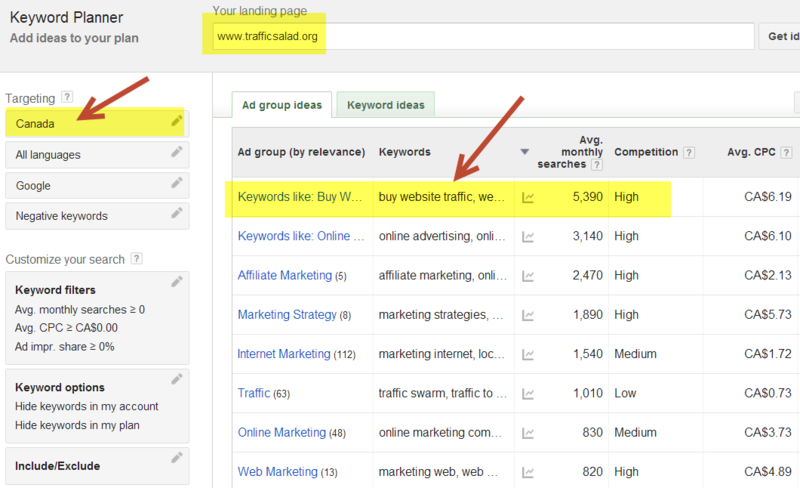 Plus, this is an easy way to identify competitors as well as potential sources to link back to in your content. Keep in mind that the pages you link to influences where you’ll rank in search results. 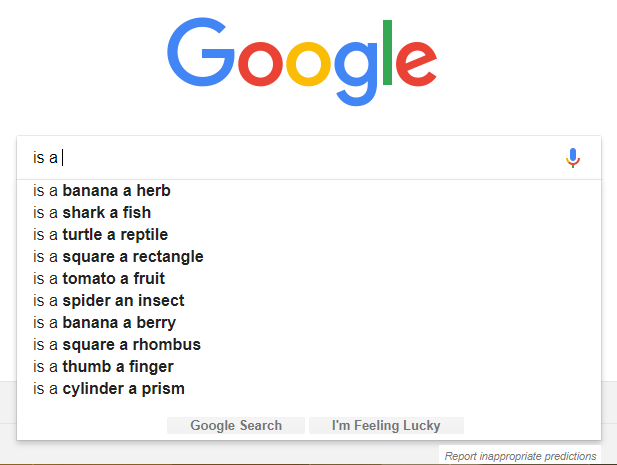 Since 2008, Google has been providing suggestions to users as they type words in the search box. Funny suggestions notwithstanding, this is a great tool for your business. You should use this to explore various “long tail” extensions of the basic keywords terms you’re targeting. For example, “lead generation” vs. “lead generation with a blog.” The latter phrase is an example of a fairly specific long tail search that I might want to target for this article, while the former is much broader. SEMRush is a paid tool starting at $69.95/month. While this might seem steep, it’s an all-in-one solution. With comprehensive keyword research and domain analytics, there’s no need to look anywhere else. They even break down the data between desktop vs. mobile searches! If you can afford the out-of-pocket cost, this is a tool that will give you a serious edge. Another paid tool, AHRefs, starts at $82/month. Again, while this may seem costly, it’s worth it if you have the money. You can use this app to do keyword research, domain monitoring and comparison, and in-depth SERP analysis. There are a ton more features, so check out the site to find out more. As I mentioned before, running a simple Google search on relevant keywords can be helpful in identifying who your top competitors are for certain keywords. Be sure that you also check out the advertisers targeting those keywords (and don’t focus solely on the organic results). This will allow you to see the HTML code for those web pages, which contain all their title tags, h1 and h2 tags, and meta tags. Take note of what variations on your target keyword(s) they are using, as well as any related keywords that might be worth including in your own blog post. One last thing: If you’re on a WordPress blog, you can optimize your posts easily for better search rankings using the Yoast SEO plugin or the All In One SEO Pack (frankly, I’m not sure of what the major differences are between the two). Keep in mind that you can use this tactic when researching competitors as well. The best “growth hack” I can recommend for your blog content marketing efforts? Treat each page on your website like it is a landing page. The thing is, when a visitor lands on your website, you don’t know how they’re going to arrive. They may head straight to your home page via a Google search. They may land on your blog. They may click on a link for a special promo and end up on your services page. No matter how they get to your site, or where they end up, you want them to receive the same exact message. You need to have a clear goal in mind. And in order to accomplish that goal, you need a lead magnet or an opt-in on every single page. 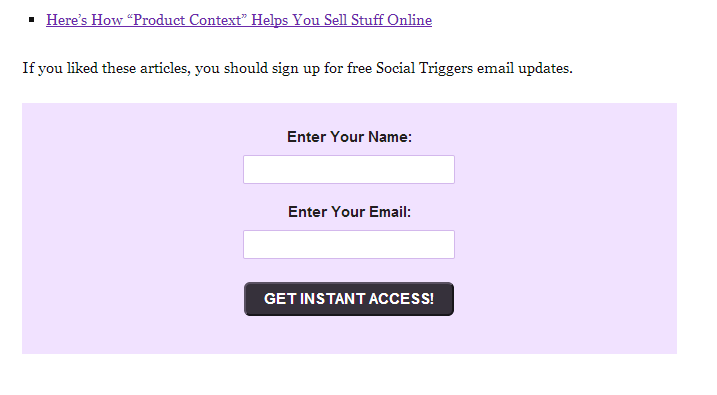 Because you are trying to generate leads via your blog, your CTA should have something to do with that. 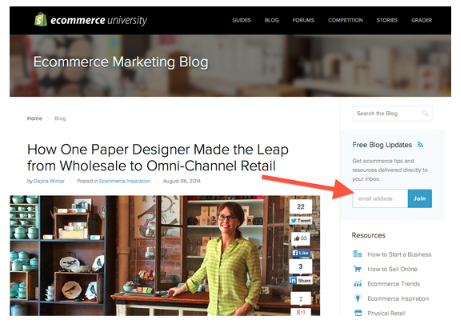 Use the footer, the sidebar, or a pop-up on each page to encourage people to sign up for blog updates. The way I implement this tactic in my blog articles is to create one simple bonus tip or download at the end of each post. Therefore, the call to action in the conclusion of each of my articles is to input your email address to access whatever the free bonus offer is. Each bonus is developed specifically to relate and be highly relevant to the topic of the article. Always keep the “law of alignment” in mind when creating your bonus. All that means is keeping your offer in line with whatever your audience is looking for. The more your product lines up with their needs, the more likely they are to hit that “sign up” button. For instance, this article is all about making simple tweaks to your blog marketing process that will result in you collecting more leads. For that reason, my bonus and CTA on this article is to receive an 8th bonus tip which tells you about 3 highly recommended WordPress plugins that can help you automatically collect more leads without requiring more work on your part. Alternatively, if you don’t feel like spending the extra 15–30 minutes that it takes to create a custom bonus like I do, you can simply include one universal call to action at the end of your articles. This will likely have a lower conversion rate, though. Also keep in mind, the offer should be for something free. See how the guys at Buffer do it at the bottom of their blog posts. If you’re unfamiliar with the term, it’s the art of capitalizing on trending news stories to amplify your own success. Newsjacking not only helps you get your name out there, but it offers SEO benefits and drives traffic to your website—traffic that can turn into leads. The idea was first popularized by David Meerman Scott’s book Newsjacking: How to Inject Your Ideas into a Breaking News Story and Generate Tons of Media Coverage. In today’s world, people are constantly inundated with new stories. Through social media, online news feeds, email, and other sources, we each see dozens of news articles every day. Usually, they’re completely innocuous, and you just scroll past. Sometimes, though, one of those stories goes viral and EVERYONE reads it. Those stories are the ones you want to be a part of. Unfortunately, no matter how popular a story is, people tend to forget about it pretty quickly. If it’s huge, it might hang around a couple of weeks. Usually, it’s more like a couple of days (or less). In order to do newsjacking well, you have to be fast. Find news. Use Google Trends to find popular topics. Follow journalists and news outlets on social media so you can monitor what they’re talking about. Follow hashtags on Twitter. 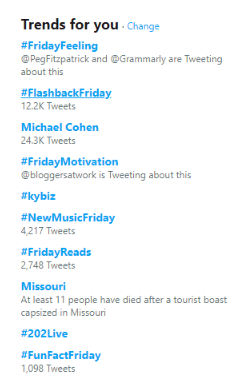 Tip: On the left side of your Twitter feed, you can see a list of what is trending in your area. You can change your location to see what is trending in other cities as well. Formulate a strategy. Is your industry related to the breaking news? How can you make your business relate to the breaking news? Oreo, obviously, doesn’t have anything to do with power (or power outages), but they still managed to insert themselves into the story. In fact, it got 20,000 likes and 15,000 retweets in under 24 hours. Publish as quickly as possible. 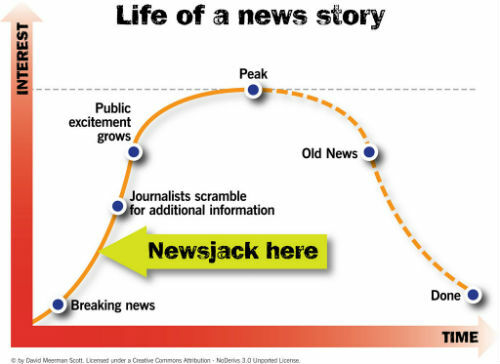 The number one rule to newsjacking? Get your story out as fast as possible. 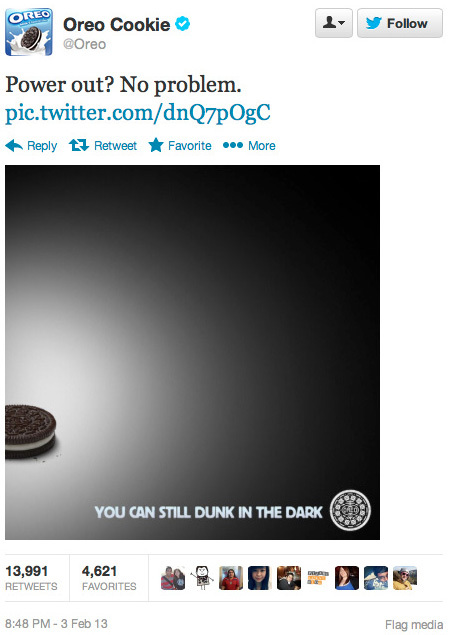 Oreo knew that. They had a 15-person social media team on hand during the big game so they could respond to anything that happened in 10 minutes or less. If you’re still wondering how you can make it work for you, check out this article from Hubspot. Your story may not garner the same results as Hubspot’s (since they’re already a huge online presence), but don’t let that discourage you. After all, you can’t get to a Hubspot-level presence if you don’t put yourself out there. Most people don’t realize how much low-hanging fruit there is in the online marketing and lead generation realm. This tip is certainly one of those low-hanging fruit situations because you don’t even need to create new content in order to start reaping the benefits of this tip. Many of the top bloggers and marketing experts use this tactic. Derek Halpern, the founder of SocialTriggers.com, as well as Andrew Warner over at Mixergy.com have implemented this tip in the past as well. Here’s what the bottom of Derek’s landing page looks like. Notice how the content is not “gated.” I would recommend A/B testing that point (i.e. requiring an email opt-in for access to the free resources). I would guess that the reason why he did it that way is so that when he reached out to others to help him promote the content, it was positioned less in a way that was about him growing his email list, and more about giving people free resources and actionable content. Keep in mind, too, that this small addition to your blog is a one-time investment with dividends being paid back in the form of residual email opt-ins over time. 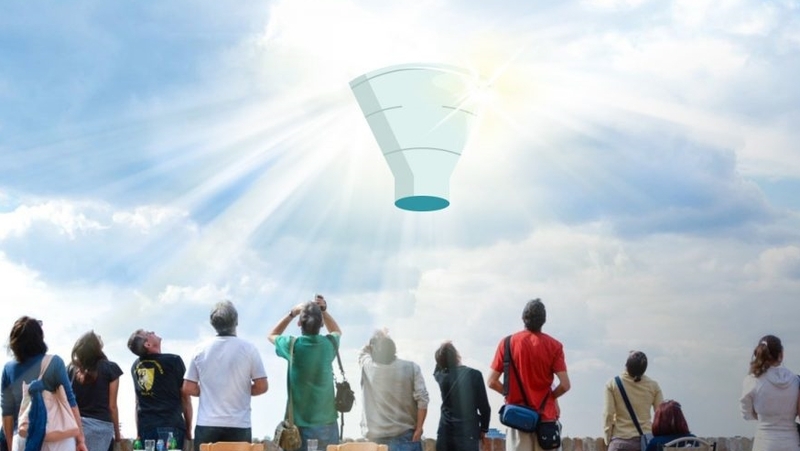 Turns out, it’s also the key to a higher conversion rate. 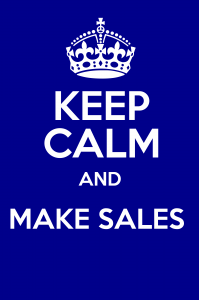 Especially when it comes to turning visitors into leads or email subscribers. For example, I recently moved up my blog’s conversion rate by about 40% when I removed one field from my email opt-in form and simply asked visitors for their email address instead. This principle of simple design as a marketing tactic is also shown in one study done at Columbia University by Professor Sheena Iyengar. For her study, she setup a free tasting booth for jam at an upscale supermarket on 2 consecutive Saturdays. In one case, 24 choices of jam were available, and in the other, just 6 types were available. Can you guess which sold better? The booth with only 6 choices of jam sold to 30% of shoppers who stopped by, and the booth with 24 choices converted only 3% of shoppers who stopped by. Put another way, the booth with 1/4 the options sold at a rate 6 times higher than its comparison booth. You can view Dr. Iyengar’s Ted Talk on the Art of Choosing here. The same goes for your written content—the simpler the better. People cannot benefit from your ideas and content if they don’t actually read it. That’s why, at the top-level, you should optimize your blog to make it easy for people to read. Keep the reading level to about 5th or 6th grade. It makes it easier to process quickly. Hemingway App is a great resource for this. Many of these ideas are also covered in an excellent self-case-study blog post from Neil Patel. By implementing these changes, Neil was able to increase the rate at which people read his articles from 40% to 65%. A lot of what I’ve discussed above could be seen as simply “email list building” tactics and not “pure” lead generation. The reason why this interpretation is wrong is because each email opt-in you receive should be viewed as an unqualified lead. By giving you permission to send them some additional information or content, subscribers have become a lead in the context of reading your content. Assuming that your content is relevant to what your business actually does to turn a profit, this is an opportunity to follow-up with them and check: can my product or service help you? This is where autoresponders come in. They are a win for everyone involved. When prospective clients subscribe to your autoresponder, they learn something that can help them grow their business or (in the case of B2C) about how to solve a specific problem in their life. For you, your customer education is on autopilot after you’ve set it up, which gives you plenty of time to focus on implementing tips 1–5. For this reason, you should at least follow up with everyone who opts-in to your offers and remind them about the free offering. This applies even if the opt-in isn’t explicitly for a “higher commitment” offer, like an email course autoresponder (it’s “higher commitment” because it requires a larger time investment compared to a newsletter or a free report). AfterOffers compiled a list that highlights 5 different case studies on autoresponders. It’s a great resource if you have the time to check it out. Incomediary used 10 different autoresponders at the same time to generate over $50,000 in revenue. 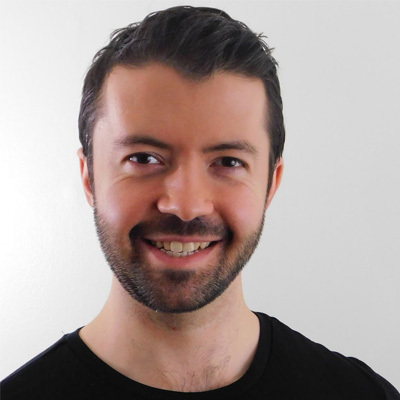 Solopreneur John McIntyre used autoresponders to triple his monthly sales. Autohacker figured out why their autoresponder wasn’t working (and then fixed it). For even more info, you can check out our articles on how to create an email funnel / autoresponder or how to grow an email list. 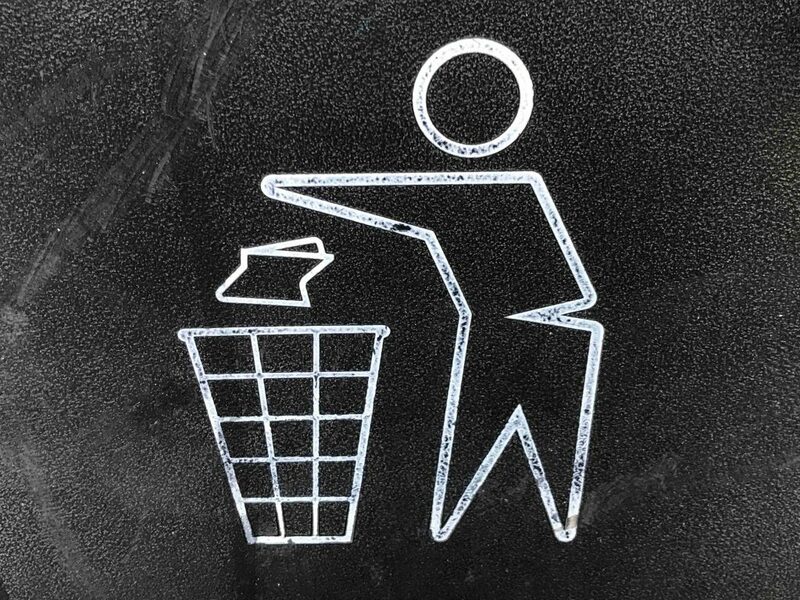 Sometimes, your blog just needs a little spring cleaning. Topics become stale and irrelevant, and sometimes they just don’t interest people anymore. If you can update that old content to make it seem fresh again, great. If not, get rid of it. Back in 2015, Ahrefs did just this. And their traffic increased by 89% in just 3 months. How? They used content auditing, keyword research, and competitor analysis to determine what wasn’t working anymore. They ended up deleting 49% of their total content. HubSpot reports that marketers who prioritize blogging are 13x more likely to enjoy positive ROI. Can you really afford to not take advantage of that? I know I can’t. Luckily, it’s easy to get started. It can be as simple as repurposing existing blog post content into a landing page or just changing the size of your font. Out of all the tips in this article, none of them should take more than an hour at most to implement—most of them far less. And that’s the best thing about these tips: they are incremental, foundational tweaks that make a huge difference in your blog’s lead generation rate over time. Are you already using any of these strategies in your blogging practice? If not, what do you plan on doing first? Hi Matt, Thanks for the information you have gathered to share with us. Each point explains the importance of lead generation and how to do it effectively through many ways. I want you to share some lead generation examples if you have, with us to get an idea of the output we are going to get. Great post. Very informative. I will use these daily. Absolutely. We are a B2B company ourselves and these techniques work for us. Thanks for the question, Phil. Hi Matt, pretty interesting the article. It resonate for me the idea to put the little box at the end of the article, for people who wants a copy of the article. How do you automate that? Great Article Matt, It still works and in future. One of my favorite ways for generating a ton of leads as well is going public on facebook, facebook groups, and doing a live and free training. You’re seeing as being credible, and people LOVE the value. Love this post! I think the hardest part is being systematic about content creation, it takes such discipline and there always seems like there are other more important things pressing for your time. Committing to making writing a habit definitely an essential step! I noticed this post is significantly larger than general posts, is that part of your strategy?